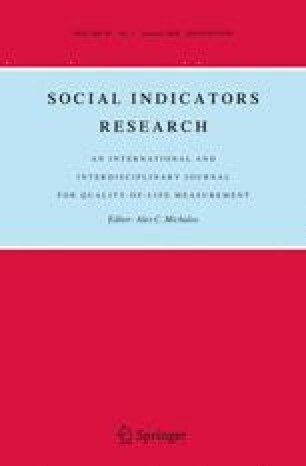 This paper describes the conceptual development of a self-enumerated scale of quality of life (CASP-19) and presents an empirical evaluation of its structure using a combination of exploratory and confirmatory factor analytic approaches across three different survey settings for older people living in England and Wales in the new millennium. All evaluations are conducted using MPlus which allows the analyst to evaluate the properties of the scale for a set of multivariate categorical items which are subject to item non-response. CASP-19 is a subjective measure of well-being derived from an explicit theory of human need spanning four life domains: control, autonomy, self-realisation and pleasure. Put formally, CASP-19 is a self-reported summative index consisting of 19 Likert scale items. The three survey settings include a postal survey of 263 people in early old age followed up from childhood when the respondents were first interviewed in the 1930's, the first wave (2002) of the English Longitudinal Study of Ageing (ELSA_1) and the eleventh wave of the British Household Panel Survey (BHPS_11) also conducted in 2002. These nationally representative surveys consisted of 9300 and 6471 respondents aged 55 years and older. The Boyd-Orr sample provides an exploratory context for the evaluation and ELSA_1 together with BHPS_11 provide the opportunity for confirmatory analyses of three measurement models. There is some support for the use of CASP-19 as a stand alone summative index. However, the analysis reveals that a shortened 12-item scale which combines the life domains 'control and autonomy' in a second order measurement model is the recommended model for analysts. The work was funded under the UK's Economic and Social Research Council's Growing Older Programme and their Priority Network on Human Capability and Resilience. Grant Nos. L480254016 & L326253061. HAPiEE Study (2005). UCL Department of Epidemiology and Public Health. Health, Alcohol and Psychosocial factors in Eastern Europe. http://www.ucl.ac.ul/easteurope/happie_open.htm. Accessed 7/12/2005. KLoSA (2007). http://klosa.re.kr/KLOSA/html_kor/klosaMeeting/KLoSA_2nd_meeting.pdf. Accessed 30/10/07. Muthén, L. K., & Muthén, B. O. (2005). Mplus short course notes day 1: Ttaditional latent variable modelling using Mplus. Copyright Muthén & Muthén. http://www.statmodel.com. Netuveli, G., Blane, D., & Bartley, M. (2007). Wellbeing and welfare states: Cross-national comparison of quality of life in market and transition economies. http://www.bath.ac.uk/econ-dev/wellbeing/conference2007/final-papers/5-irq/Netuveli Blane Bartley.pdf. Accessed 30/10/07.